High Quality Long Weld Neck Flanges, Slip On Flanges, Orifice Flanges, Blind Flange, Industrial Flanges Supplier, Weld Neck Flange, Groove Flanges, Socket Weld Flanges Exporter In India. Stainless Steel Slip On Flanges, Carbon Steel Weld Neck Flange, Alloy Steel Blind Flanges, Duplex Steel Orifice Flange, Monel Flanges, Inconel Flanges Supplier In Mumbai. APN Steel is a one of recognized firm that exports a wide range of Pipe Flanges, which is known for Precisely design, Rust resistance, High strength, and more. Offered by us at industry leading prices, our Stainless Steel Flangesare known for their accurate dimension, resistance to corrosion and optimum durability. Our organization is providing an extensive series of these Carbon Steel Flanges, which are developed using the best grade of material. Demands of our Alloy Steel Flanges are increasing day by day owing to its application specific design and high tensile strength. Furthermore, our importers additionally guarantee that these fashioner Duplex Steel Flanges are quality checked by the universal quality mechanical standards. We are step ahead of our competitors in offering a qualitative range of our Inconel Flanges, which is used as the propeller shaft of ship, pump shaft, valve parts, aircraft fittings, nuclear reactor components, gears, paper mill equipment, missile fittings and jet engine parts. These Monel Flanges have undergone stringent checks and thus we ensure you that the qualities of these flanges are unmatchable. With our name synonymous with high quality manufacturing, precision machining and unparalleled dedication to quality excellence of our Hastelloy Flanges, we have steadily maintained our position in the fore front of oil industry. 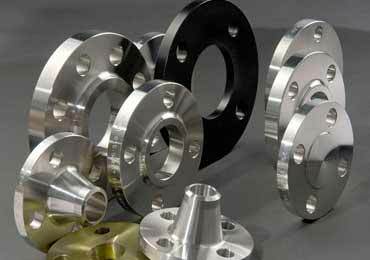 We are one of the leading dealers and exporters of these Titanium Flanges that are available in a number of sizes and dimensions to meet a number of customer demands. Carbon Steel : ASTM / ASME A 105, A53 GR B, A106GR B, API5L GRADE B, API 5L, GRX42 / 46 / 52 / 56 / 60 / 65 / 70, A333 GR 1/GR 3/GR 6, A/SA 672 GR 8C60/C70 etc.. Size: 1" / 1/2" / 3/4"
Packing plays very important role for Flanges. Different types of packing methods are adopted by APLLON STEEL INC, depending on the customer’s need and type of product. Selection of type of packing depends on customers need as specified in customer’s purchase order. If nothing is specified in the customer purchase order, our standard packing style is followed. All shipping documentation is provided for Flanges delivery from mill to customer. All the Flanges are supplied with standard end capes on both ends. 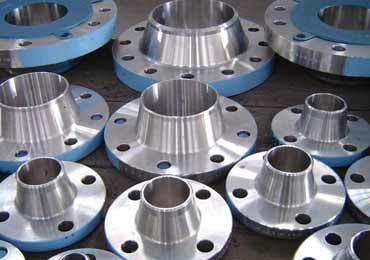 Special types of Flanges are supplied if required by customer. Shipping Marks are attached to each Wooden Crate, Wooden Box and Bundle Packing.